Complete set of 3 books listing Australian bands & musicians who worked during the 1950’s & 1960’s, sold together at a reduced price. Australian Bands Of The Sixties Vol. 1 (ISBN 1-876187-28-X) LENGTH – 46 pages. Australian Bands Of The Sixties Vol. 2 (ISBN 1-876187-34-4) LENGTH – 56 pages. 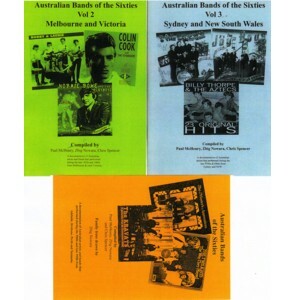 Australian Bands Of The Sixties Vol. 3 (ISBN 1-876187-35-2) LENGTH – 64 pages. Sydney and New South Wales. 2000 Weeks + The Real Thing ?